Accton recognizes that the Earth has limited resources and that sustainable development is of the utmost importance, therefore Accton is committed to its certified ISO 14001 Environmental Management systems for product design, development, and manufacturing. 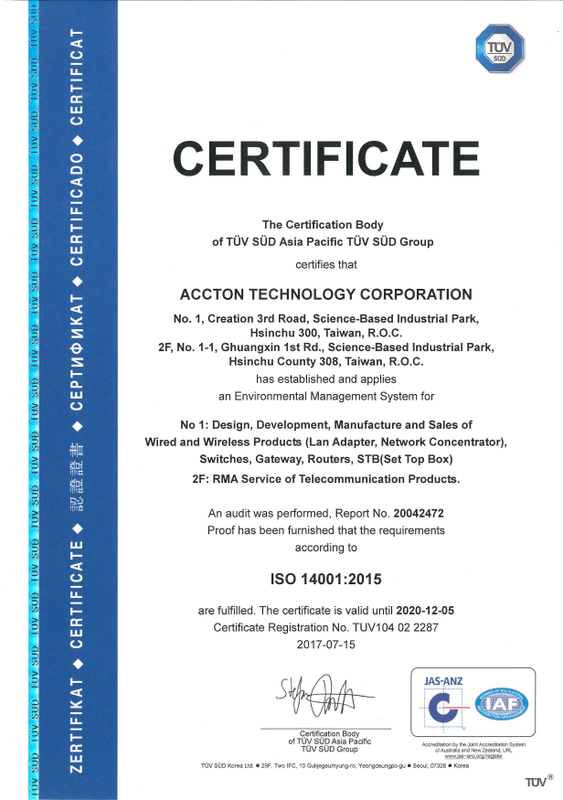 Recently, an ISO 14001 renewal audit was conducted and Accton fulfilled all the requirements for ISO 14001:2015 certification. Accton is committed to a 1% annual reduction in greenhouse gas (GHG) emissions. Our Scope 2 Indirect GHG emissions (generation of purchased electricity) in 2017 were 3,496 ton CO2e (carbon dioxide equivalent). 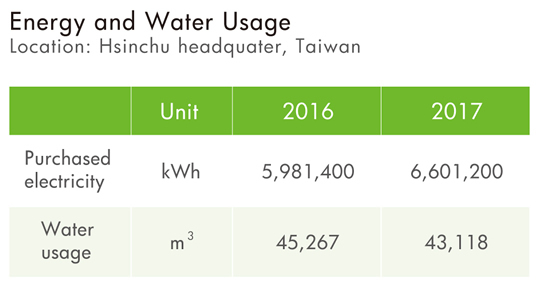 The table below shows the GHG emissions from Hsinchu headquarters in Taiwan for the past three years. Using electronic signatures to reduce paper use. Turning off lights and air-conditioning in idle areas. Controlling the number of ice-water dispensers that are powered on depending on room temperature. Regular timing control of the basement ventilation system. Installing variable-frequency inverters in air-conditioning and air-compressor systems to save energy. Switching to LED lighting systems. Upgrading air conditioning system to improve energy efficiency. Replacing old electric power systems. Upgrading the energy consumption of passenger and freight elevators. Using reusable utensils in our canteen and restaurant. For Accton, purchased electricity is the only important main energy consumed. Since 2016, we have installed energy-efficient lighting fixtures and light bulbs in our offices. In 2017, Accton consumed 6,601,200 kWh of energy. Since 2016, water-saving toilets and dual-flush toilets were installed to reduce our water consumption. In 2017, Accton used 43,118 m3 of tap water, saving 5% of water used compared with 2016. Accton Technology’s waste management is in accordance with the Waste Disposal Act and our waste cleansing proposal is approved by the Science Park Bureau. Technical personnel with a LEVEL B Qualified certificate for waste disposal is in charge of waste cleansing. The amount of waste produced, stored, and managed is declared online; and properly disposed through waste treatment vendors approved by the Environmental Protection Administration. No violations occurred. Accton has continuously reduced waste through sorting, reusing, and recycling waste. The annual recycling rate was improved from 61.4% (total waste 294.76 tons; reused waste 181.001 tons) in 2016 to 64.9% (total waste 353.316 tons; reused waste 229.464 tons) in 2017. Wastewater management is in accordance with the Water Pollution Control Act, differentiating domestic sewage and industrial wastewater. No industrial wastewater was produced during manufacturing; domestic sewage was treated through internal facilities and discharged into the Science Park wastewater management system. Comply with environmental safety, health laws, and regulations to effectively operate and constantly improve the environmental safety and health management system. Regularly promote recycling, reuse, and minimize industrial waste. Strengthen staff education, supplier and contractor management, and provide and promote environmental safety and health training. Immediately inspect unsafe actions and environments in order to prevent accidents. Health management shall maintain staff’s health so that they will be safe with no accidents.